of six large-scale photos are depictions of “fantasy installations in monumental exhibition spaces The Italian Job download . The works deal with issues of abstraction, conventions of documenting art, and the ideology of the gallery space.” The results are spectacular. 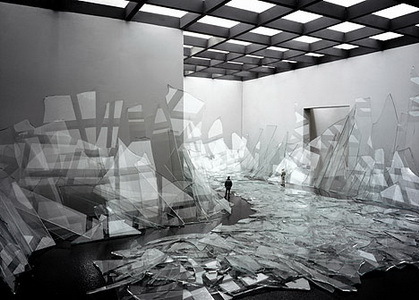 Huge panels and slices of broken glass reflect the intersections of the lowered ceiling as viewers carefully make their way between the giant shards. Mountains of salt and asphalt dwarf the gallery visitors as they contemplate both the tidiness and the mess of the materials around them. More at: C.O.L.A.